The Andrea Air Purifier is a brilliant partnership between man and plant that accelerates nature’s natural ability to clean air in order to detoxify the atmosphere inside your home. We had a chance to sit down with Tom Hadfield from Andrea to talk about how this amazing gadget is able to clean the air in your home 1000% better than a normal houseplant. Check out our video interview above! Andrea was invented by French designer Mathieu Lehanneur and Harvard professor David Edwards as a part of a artistic science experiment in 2007. The purifier, which hit the shelves of stores in North America in January of 2010, is able to amplify the air cleaning ability of a plant with the help of a mechanical fan that moves air past the plant’s leaves, through the soil and roots and out through a water tray that collects toxins. http://www.consumerreports.org/cro/magazine-archive/2010/september/appliances/best-air-purifier/natural-air-purifier/index.htm This is bogus.... I wish it was true, but this andrea air purifier is worth nothing. how is this any better than an aquarium full of plants fitted with an air pump? just set up our first ANDREA with an Aloe Vera plant inside and am loving it.... Andrea is a revolutionary new air purifier engineered to significantly improve the air filtration capacity of natural plants. This living filter accelerates the removal of harmful and toxins through the active infrastructure system of a plant to continuously clean and oxygenate the rooms ion your home or office. 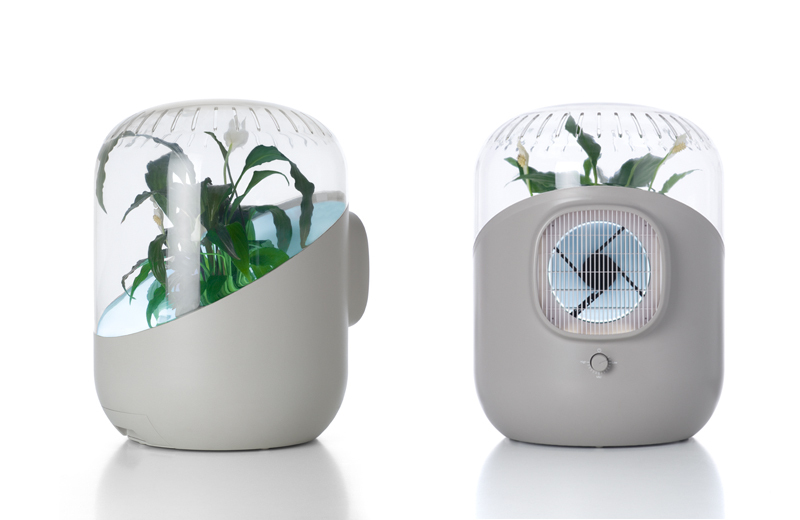 Andrea naturally purifies air by drawing it in with a whisper quiet fan to propel it through the leaves and root system of a plant, then out through the water and soil filtration and back into the room . Works with any household plant. Otra farsa más de los especuladores del la trágica situación ambiental. Aire puro solo para quienes puedan acceder a este producto los que tienen dinero por favor. Well call me old-fashioned but I'd rather have ten normal plants, then 1 inside a piece of plastic. > is a brilliant partnership between man and plant I don't understand how this is a partnership. Locking away a plant in a tiny container seems to me no different than locking up a chicken in a cage not much bigger than the chicken itself to harvest its eggs. There was an article from Consumer Reports, you need 4 in small room to do anything significant. The scientist that did the research the it was misrepresented. Open a window and that's free. I can't imagine this thing has much value at all. For $200 you could buy your own planter and a dozen plants and still have enough left over for a smaller, quieter fan. I'm thinking the only thing 'green' about this product is the cash it will take out of your wallet. For much less than $200, you can purchase a small HEPA filter which removes more types of particles at a higher rate. Hi, Love the product. How to order this product? We are from Malaysia. What is the price? Actually, he said 1000% more effective, which is 10x better than a plant without the fan, not 1000 times better. The real challenge is comparing Andrea to a conventional air purifier using carbon filters and perhaps electrostatic precipitation. Is it really a viable alternative? This is a really interesting and unique air purifier. We'd be interested in becoming a distributor for this product. We currently distribute another air purification product that is based on NASA technology. I could see this Andrea air purifier as a great Natural Alternative way of purifying air on a room to room basis. How many SQ feet are these units capable of purifying? This would be an even more amazing product if it was made out of biodegradable & recyclable ENSO plastic. 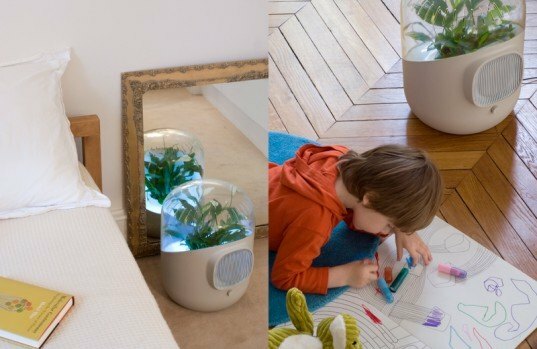 I'm obsessed with this air purifier and want one for my next apartment! There's a list of the top 10 air purifying plants that was released by NASA... If you used one of those 10 plants in conjunction with this beautiful technology... it would be one clean room. I literally drool over this. The Andrea Air Purifier is a brilliant partnership between man and plant that accelerates nature's natural ability to clean air in order to detoxify the atmosphere inside your home. We had a chance to sit down with Tom Hadfield from Andrea to talk about how this amazing gadget is able to clean the air in your home 1000% better than a normal houseplant. Check out our video interview above!